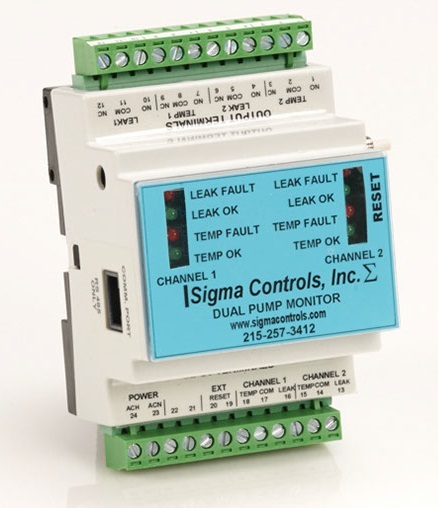 The Sigma Controls 100S series SL/OT is a two pump monitor/controller for monitoring the internal temperature and shaft seal of two submersible pumps. Moisture ingression detected by an internal NO/NC float switch or embedded conductance probes. Adjustable sensitivity is provided. Overtemperature Detected by an internal temperature switch. NO or NC or by a 100 OHM RTD probe. Adjustable set point is provided. In the event of a power loss while alarms are active, any alarm that was active will return to their active state upon restoration of power.